Why we believe in Free Pre Approval at TexasLending.com is simple. We want our customers to be successful in reaching their goals of buying a home. The information you receive during the pre approval process is valuable and can help you navigate the journey to home ownership. The purpose of this article is to give you a road map to being Pre Approved for a Home Loan. The best news is that you can be pre approved in 48 hours or less. Follow these steps to begin your home buying adventure with free pre approval. We are here to help with all of your financing questions about buying a home. You can easily submit an inquiry from your mobile device or computer on TexasLending.com. Call us at 972-387-4600 to immediately connect to one of our licensed mortgage consultants. We want to know about your home buying goals so that we can serve you best. Buying a property in the city comes with different mortgage options than rural areas. The mortgage on a single family home is structured differently than a condo. These are just a few examples of how helpful it can be to talk about your goals at the beginning. In order to buy a home you will need to meet minimum credit requirements. Your credit should show that you use credit responsibly with a good score. Talk with a Texas Lending mortgage consultant about your credit score and loan options. However if your credit needs some improvement, don’t worry. We can help you understand what it takes to build better credit. Read our post that addresses how a good credit score can help you save money on your mortgage. Your Texas Lending mortgage consultant can take your pre approval application over the phone in just a few minutes. Our technology makes it easy to submit your documents to verify your income and assets. In fact, most of the mortgage application and process can be completed securely and quickly on your mobile technology. In another article we discussed how to prepare for the home buying process to help make the mortgage process as easy as possible when buying a home. Once you are pre approved, it’s time to start shopping for your dream home. We can refer you to a great Real Estate professional. Using our Realtor Connect program can help you earn cash back after you close on your new home with TexasLending.com. Why free pre approval is an important first step in home buying. 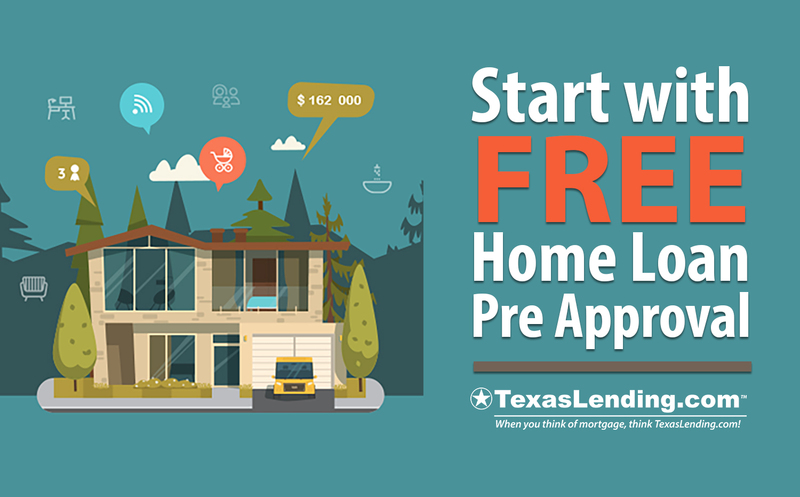 If you are thinking about buying a home, but aren’t sure where to start… Reach out to us at TexasLending.com to get a free pre approval.